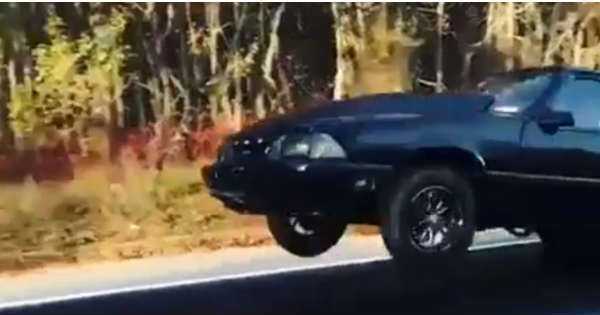 Awesome FOX BODY MUSTANG Performing One Insane Wheelstand! - Muscle Cars Zone! Awesome FOX BODY MUSTANG Performing One Insane Wheelstand! Over the past five years, the Ford Fox Body Mustang has literally exploded in popularity. This great muscle car is especially popular with hot rodders. The Fox Body Stang now is becoming a hidden gem, so get one before they are all gone. However, most youngsters can`t tell what a Fox Body Stang is, and we don`t blame them. This is actually a Mustang manufactured from `79 to `93. Having said this, it doesn`t matter at all if it is a convertible, a hatch or a coupe, if it`s manufactured between the aforementioned years, it`s a Fox Body. It also doesn`t matter what transmission or engine it has. We admit it`s a weird name for a car. However, it`s called this way because they are all built on the Fox platform by Ford. Ford designed this platform to downsize he gigantic cars they built in the 1970`s. In this video, a couple of gearheads who happen to own a Ford Fox body perform the perfect wheelstand. Now, perfecting the wheelstand is no easy job. In order to perfect it one needs to walk the fine line that`s between agony and glory. As you know, in drag racing, there`s nothing more dramatic and awesome than a wheelstand. The front wheels are high in the air, and the rear times slammed into the pavement. This is the decisive moment that`s between glory and disaster. You can also hear the monstrous engine inside this Ford Fox Body Stang. We can`t tell for sure what engine lurks inside, but we suppose that this is an LS swapped Fox Body Mustang. Finally, click here to watch a video of the fastest side wheelie in a car! Lift? No way! Tyler No Boost doing his thing.